He desires, then, it seems to me, to enter with pomp and magnificence into the palaces of kings and princes, therein to be honored as much as He has been despised, humiliated, and outraged in His Passion. May He receive as much pleasure therein at seeing the great ones of the world abasing and humbling themselves before Him as He once felt bitterness at beholding Himself annihilated at their feet! To comprehend Almighty God's request with regard to the standard, we must recall that, from the earliest ages, France had always had a sacred standard, one that was not borne to vulgar combats; one that rested in the sanctuary of St. Denis under the shadow of the country's holy protectors. It was removed from its sacred shrine only when the monarch headed the army, when it was solemnly sought in the hour of the greatest danger, or when it was to be carried afar to the holy wars. It symbolized the religious soul of France, and floated like a sacred prayer amid the nation's banners. It was a standard of this kind that God had given to Joan of Arc. He had prescribed its form and emblems, and communicated to it the secret virtue that roused exhausted France to unhoped-for triumphs. Today, through the lips of the virgin of Paray, God asked of the king of France something of the same kind, a sacred standard which was to symbolize an act of faith. It was to be borne side by side with the nation's flag, and, in a voice that could be distinctly heard above the proverbial bravado of her enemies, proclaim that France places her trust in the blessing of God. The Eternal Father, wishing to repair the bitterness and agony that the Adorable Heart of His Divine Son endured in the palaces of earthly princes, amidst the humiliations and outrages of His Passion, wishes to establish His empire in the heart of our great monarch, of whom He desires to make use in the execution of His designs, which is to have an edifice erected in which shall be a picture of His divine Heart, to receive the consecration and homage of the king and all the court. Moreover, this divine Heart wishes to make itself the defender of the sacred person of the king, his protector against all his enemies. 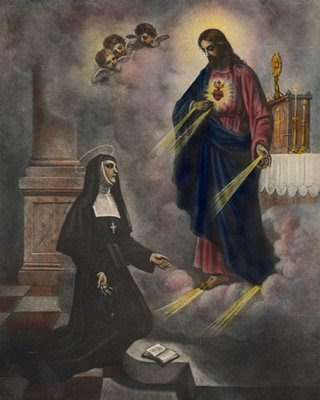 Therefore has it chosen him as its faithful friend, to have the Mass authorized by the Holy Apostolic See, and to obtain all the other privileges that ought to accompany devotion to this divine Heart. It is by this divine Heart that God wishes to dispense the treasures of His graces of sanctification and salvation, by bestowing His benediction on the king's undertakings, according a happy success to his arms, and making him triumph over the malice of his enemies. We have not Mother de Saumaise's answer to his letter of August, 1689. She who had known how to reach Rome and arouse the thoughts of the Sovereign Pontiffs would neglect nothing to to reach even Louis XIV. We know that she had recourse to the Superioress of the Visitation of Chaillot, the refuge of Mlle. de la Fayette, where dwelt the queen of England, and which held, so to say, its door open to the court of Louis XIV. Might it happen that Pere de la Chaise would not dare to speak of it to the king? Might it happen that Louis XIV's soul would not be sufficiently humble to comprehend the Christian grandeur of such a thought? Be that as it may, those tender and magnanimous advances to the Heart of Jesus were not understood, and Margaret Mary's last admonitions were without avail, were lost in oblivion. They were, indeed, her last words, we are at the close of 1689, and she was nearing her death.